Today marks the third anniversary of the martyric death of Fr. 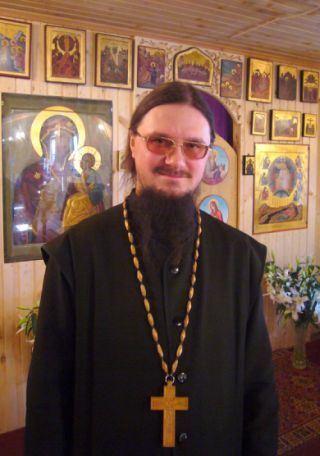 Daniel Sysoev, who was fatally shot in the Church of the Apostle Thomas in Moscow on November 19, 2009. His work continues: books he wrote are being published, a missionary school named after him is functioning, and a benevolent fund in his name is helping the families of priests who have perished. To mark today’s anniversary, we offer the following recollections of Fr. Daniel by his close friend and co-worker, Archpriest Oleg Steniaev. We met in the mid-1990s: I was a priest and he was still a deacon. He came to our Center for the Rehabilitation of Victims of Nontraditional Religions [in Moscow] and said that he, too, would like to engage in the same kind of work. Soon, with the blessing of the bishop, he began to hold talks on the Bible at the Krutitsy Metochian [also in Moscow]. Thereafter we were in constant contact. It would happen that I would be sitting in the church refectory and he would come and pose a theological question of extraordinary complexity. We would begin to discuss it, sitting there for an hour or two. This is what he lived for. When meeting somebody, one normally asks: “How’s it going? How are you?” But here was someone who lived in constant reflection about God, His Kingdom, and eternal life. When the warlord Said Buryatsky [of the Riyad-us Saliheen Brigade of Martyrs in Chechnya, d. 2010] sentenced him to death, he made two charges: first, that Fr. Daniel conducted open debates with Muslims; and, second, that he baptized them. In fact, the debates were held on the initiative of the Muslims themselves. And the fact that they were approaching him for Baptism shows that they were missing something in Islam, which is why they left. I said to him: “They’re going to kill you!” To which he replied: “What are you talking about? I’m unworthy!” He felt that if he were killed for the faith he would become a martyr. There was no shadow of fear in him, only reverence before martyrdom. It is thought that martyric deaths are sent only rarely. Someone gets killed when he is feared; people are afraid of his spiritual greatness. Fr. Daniel received fourteen warnings. Even on the day he was shot, they first called him to demand that he stop talking with Muslims. Following his death, many Muslims received Baptism. Priests from other churches have told me about this. His murder brought about the opposite effect [than had been intended]. My spiritual father, Fr. Dmitri Dutko, died several years before Fr. Daniel was killed. I told Fr. Daniel that I was going confess to him. He replied that he also wanted to confess to me. This continued until his death. When saying his confession he would be furious, frantic. He poured himself out as through a kind of sieve. And this “kind of sieve” was Biblical Revelation and the Church Canons. Naming his sins, he would begin to speak in an almost biblical language. He gave advice only if I asked for it – I was older and he would always become embarrassed and say: “Steniaev, you know all this yourself!” I would say: “No, now I’m confessing to you, and you need to give me advice – it’s your duty.” And so he gave me advice. Now I stand in great need of it. The last time I confessed to him was “in the tombs.” I went at night to the metochian where his coffin was on view. I walked over, bent down, and confessed to him for the last time. Did I know that he was a saint? Yes, I knew. Friendship with saints is not easy. Saints are difficult people, they are always in the breach, they are ahead of those around them in terms of ideas, words, and actions. From the side it looked like he was hurrying. In fact, it was we who were lagging behind. He was not hurrying; he was a balanced, measured person. But he set the tempo, the intensity, and this did not make life easy. In ancient times, the martyrs were not formally canonized. The veneration of martyrs began immediately following their deaths. For a martyr to be venerated, it was enough that he not be a defrocked clergyman, that he acted with the blessing of the church hierarchy, and that he died for the faith. And that was all. There are already icons of Fr. Daniel in Serbia and there is one on Athos. He is already being venerated.